John Newton lived a tumultuous life on land and sea. His faith-filled mother died when he was a young boy and his sea captain father began taking him on voyages when he was just eleven. For the next two decades, he endured the rigorous life of a sailor. He ultimately deserted that life before the mast, but was captured, press-ganged onto a navy ship and flogged. He then joined the slave traffic industry and suffered a stroke. During a tremendous storm at sea, though, his divine purpose rose up and he recognized his need for the “Almighty Saviour.” He began working as a tide-surveyor, where he heard great evangelists speak and he turned to preaching. 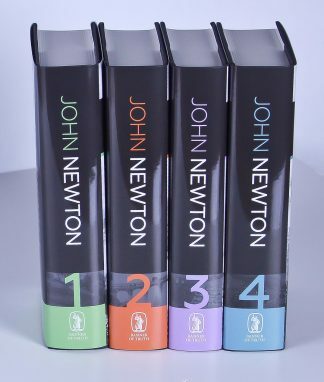 Letters of John Newton have been published, and The Works of John Newton is available as a four-volume set. Other John Newton books include Jewels from John Newton, Select Letters of John Newton and more. In these letters from John Newton (1725–1807) to John Ryland Jr. (1753–1825) we find not only mature and wise counsel, but a wholesome emphasis on true Christian experience, a great breadth of Christian sympathy, and a strong confidence in the power of the grace of God. 432pp.